This is just disgusting. I’m appalled at Lise Lefebvre’s so-called take on natural design, the Barenjager bear skin rug. 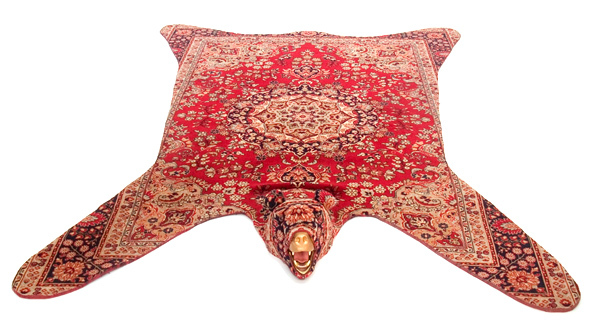 I mean, there are only a handful of Persian Carpet Bears left in the world, and half of them live in captivity. The destruction of this bear could mean that the wall-mounted, singing fish population would skyrocket out of control. As a result, the Drunken Toothless Redneck beaver population of southern Saskatchewan would increase sharply. And we certainly don’t want another Christian Right movement. Well, if it weren’t for the Christian Right, we’d all be living in a Socialist country. Oh, wait, we are living in a Socialist country. This writer is a commi socialist. o…m…g. I thought people like you went extinct. Thanks for reading.